It’s a long one, an hour, with just Funky Ceili and a couple of tiny snippets of music - but it’s Larry. Always a great interviewee, Larry talks Milton, Joyce, Hemingway, music formats, Theatre, Sean O Riada, songwriting, playing music, modern dance, Miles Davis, Lyrics, Shane MacGowan, New York, set lists, writing books, and lets us know that he’s more of bath man than a shower man. He’s Irish you see. Kirwan tells us for Black 47 the next step is an Irish album i.e. 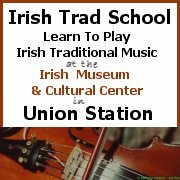 take ideas of old songs and write new songs in the traditional Irish way. Larry is rather frustrated with Irish and Celtic musicians who play the same Irish songs all the time when there are thousands of other Irish songs that are better. An album/CD to look forward to immensely. This entry was posted on Tuesday, May 16th, 2006 at 3:52 pm and is filed under Black 47, Pogues, Sean O Riada. You can follow responses via my RSS 2.0 feed. Both comments and pings are currently closed.